As August turns into September, many students in the Gulf Coast area are either already back at school or preparing to return soon. It's an exciting time - and unfortunately, sometimes a dangerous one. Students, from young children to college students, are some of the most vulnerable people on our roads, and a child who is hit by a car can be severely injured or killed. Florida routinely ranks among the most dangerous states in the country for pedestrians and bicyclists, and students - who often do not have the same level of situational awareness or decision-making skills as adults - are at elevated risk. 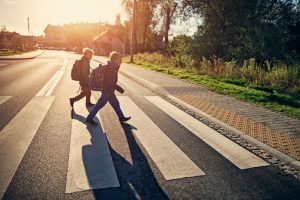 Both pedestrians and motorists share a responsibility to stay safe on the road, but when those pedestrians are children, motorists have an even greater responsibility to avoid collisions. Look out at dawn and dusk. Many schools start early, and many students have evening classes or participate in sports and activities. Especially as the days start getting shorter, these are dangerous times due to limited visibility. Be aware of conditions. Pedestrians are vulnerable on rainy days again due to lower visibility. Moreover, if the road surface is wet, your stopping distance will be longer. Slow down in school zones. Likewise, be alert when driving near other areas where children congregate, such as local parks. It's not uncommon for young children to dart out into the road. Take your time coming out of your driveway. Children are often waking to school or to the bus stop at the same time commuters are leaving their homes. Back out slowly, turn to look behind your car, and roll down your windows so you can hear approaching children. Don't pass stopped school buses. It's illegal in Florida, and for good reason: Children could dart into the road from any angle. Come to a complete stop and stay stopped until all children are clear of the roadway and the bus withdraws its stop sign. Avoid distractions. Distracted driving is a leading cause of pedestrian accidents. It's easy for motorists who are texting, playing games, talking to passengers, or adjusting the radio to miss pedestrians, especially children. Put the smartphone down and stay alert. Be especially aware around young children. Developmentally, most children under the age of 10 are not able to judge the distance and speed of an approaching car. That means motorists need to be hyper-vigilant near elementary schools and other places where young children may be present. Sarasota motorists have a responsibility to watch out for the most vulnerable people on our roads and drive defensively and safely. And if your child has been hurt by a negligent motorist, your family has the right to seek justice.